* The name is apt as the immediate top note of lavender is strong, intense, and makes a big impact. * Impact is an Pure Parfum version of the classic Caron Pour Un Homme. * Lavender stays in the starring role as a smoky vanilla enters the scene as a supporting player. * Surprisingly, it’s quite rare to find Pure Parfum concentrations of fragrances aimed at men – most Pure Parfum and even EdP are categorized feminine. * The smoke eventually blows away, while a clean musk and amber form the base with lavender still in the forefront. Summary: Impact is a luxuriously focused version of Pour Un Homme. Gone from the original are the citrus, floral, and wood notes- leaving a strongly focused and intense take on lavender supported by vanilla, amber, and musk. Scent-lovers often protest when the classics are remixed, so to say, but I actually enjoy Impact more than the original. It pays respect to the classic and modernizes it with a powerful edge. Impact is a strong scent that makes a statement and will get you noticed in a crowd. 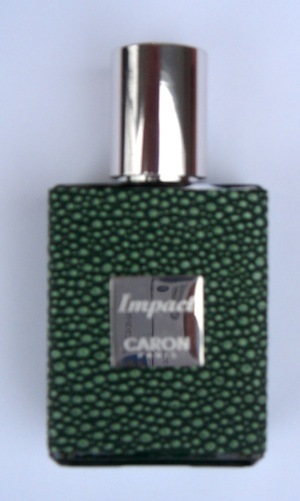 Caron Impact is only available from Caron Boutiques. For those in the US, contact the Caron boutique in NYC and ask for Diane. If you are ever in NYC, make an appointment and stop by for a visit. Be sure to get directions as it is hidden in the Phyto Universe salon above another store and is difficult to find.